bCast adds more customizable cast bars into rift. 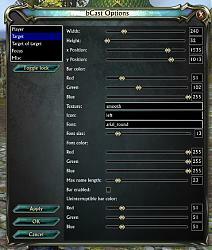 Supports player, target, target of target and focus cast bars with profiles. - Support for non-player bars. Profiles are account wide, so remember to make different profiles for different characters (or roles) if needed. When updating to 2.0 and above from previous (1.x) versions, all settings will be reset. Shouldn't need to do this again, so should be just a one time thing. /bcast help - Prints this help. /bcast config - Opens the options window. /bcast profile <profilename> - Changes the current profile. /bcast lock - Toggles the locking & unlocking of the cast bars, allowing them to be moved. /bcast reset - Resets the current profile to default values. /bcast gcd <position> - Changes the global cooldown bar position, valid values are above, below, none. For bar settings, you need to specify which bar you want to change with its unit name. Valid unit names are: player, player.target, player.target.target and focus. Any command without a new value will print out the current setting. /bcast <unit> width <new width> - Changes cast bar width. /bcast <unit> height <new width> - Changes cast bar height. /bcast <unit> texture <new texture> - Changes cast bar texture, texture file needs to be in bcast\media\ folder. /bcast <unit> fontSize <new size> - Changes font size. /bcast <unit> font <new font> - Changes the font, font file needs to be in bcast\media\ folder. /bcast <unit> fontColor <R G B> - Changes the font color in RGB, range 0 - 255. /bcast <unit> icon <icon position> - Changes the cast icon position, valid values are left, right and none. /bcast <unit> barColor <R G B> - Changes the bar color in RGB, range 0 - 255, for example, default bar color would be 51 201 255. /bcast <unit> unIntBarColor <R G B> - Changes the uninterruptible bar color in RGB, range 0 - 255. Doesnt work for the player bar. /bcast <unit> timeStyle <style> - Changes if the cast time is shown as time already spent casting (done) or time still left in the cast (remaining). /bcast <unit> pushback - Toggles the pushback display on maximum cast time, only works on the player bar. /bcast <unit> enable - Enables the bar. /bcast <unit> disable - Disables the bar. Error: Event Event.Ability.Cooldown.End is deprecated, the addon environment is not in compatibility mode, and bCast has an active hook (named CDEnd). Hello man, rly good addon but have 1 problem: mages with pyro soul have 1 sec GCD, but anyway have 1.5 sec GCD bar and bar hide on 2/3 of track, how i can fix it? I think self.tot take wrong number with pyro. I think in source of V value, CD=1.5 anyway. But when u use pyro value change in other place. It looks like this is caused by a bug in the addon API, it should be fixed with the release of Rift patch 1.9.
now it work for pyro, but if im in other build it doesnt work. Last edited by Arzanis : 01-08-12 at 09:20 PM. Is there a way to set the strata(?) or insure that its viewable if stacked on something? I use Myui for unit frames and trying to put the cast bars over the top of them but they disappear behind them. Any suggestions? If a player or mob is casting but I don't have them targetted then when I target them during their cast, the cast bar does not appear. It seems you have to have them targetted before they start casting as I guess your addon responds to a start casting event of some kind. Now that you mention it, probably broke that with the last patch. This was exactly what I was looking for in a cast bar, and the features exceed my expectations. Being able to use my own textures and modify the color, as well as size is perfect. So, just a huge thumbs up and thanks for all the work you put into this. Can we get a command line option to turn on/off the castbar we can add to a macro? I like to use this on 2 of my roles, but not on the other 3. Being able to add it to my role switch macro would be great. By the way, grantus stated that MinUI is no longer going to be updated, and he's passing it on to anyone interested in taking it up, would you be wanting to? Considering, the unit frames go well with your addon 'bCast', it would be a great fit, for those that rather not have the cast bar combined with the unit frames, like myself. Could I request a target castbar option too please? That way I'll know just when to interrupt a spell during combat if I can? Currently using TCB to monitor interrupts and while it is a great addon changing the size of the cast bar can only be done by scale and not by actual dimensions (width/height) like you can with bCast. This is not true. /tcb custom X Y has been in TCB for several weeks. I chose this addon over the others because of the design. I like this design better. However, they're both great addons. I simply just prefer a certain design aspect. All though, moving the addon around on the screen by clicking and dragging, is much better for me than X Y or any other way... because I'm horrible with numbers, position and code. That's why I use Align before I start moving anything, so I can get it adjusted to the right position that I want.